“Heathrow announced today that it will be ending the current airspace trials two months early, on the 12th November 2014. This is in light of residents’ feedback (thanks to all those that signed the petition and included comments) and meetings with local groups, authorities and MPs. LHR then expressed their wish to end the trials early due to the massive number of complaints they had received but also needed to ensure enough data was recorded to have results analysed. Below is a copy of the Webtrak record for 10.30pm on the 23rd May 2018 (nearly 4 years after the start of the Trials). 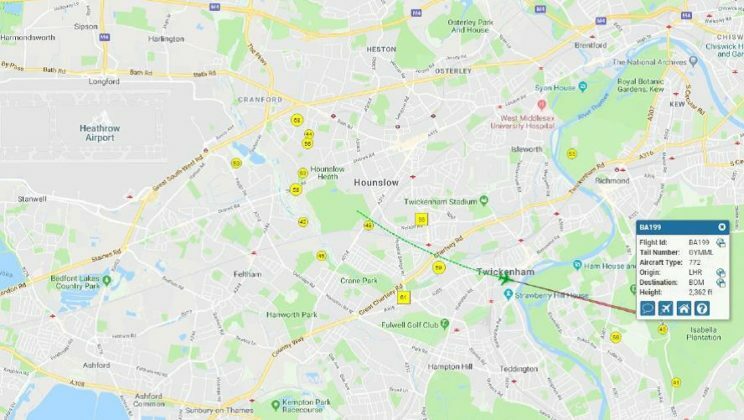 A Boeing 777, a plane capable of climbing faster than most planes even when fully loaded and which by Twickenham could have got to nearly 5,000’ had got to a mere 2,360’ with all the consequent suffering put upon communities surrounding the airport. Some people are starting to move away. “The reference to “encouraging aircraft to gain height as quickly as possible and then reduce engine power” relates the phase of the flight up to 1000ft”. That is not going to get any noise abatement worth having and warrants treating the draft Noise Action Plan with the contempt that it deserves. 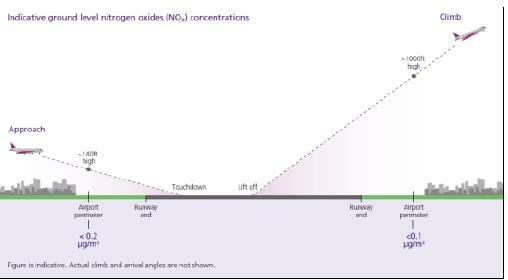 Perhaps the most extraordinary part is that John Holland Kaye gave written evidence to the Transport Committee of the House of Commons supplementary to his evidence on the 5th February 2018 in which he said that aircraft “are on average at 1,000’ when they cross the airport boundary” [with illustration below]. This presumably means that the entire operating procedure part of the draft Noise Action Plan for 2019 – 2023 relates to the land within the airport boundary! The government is controlled by the corporations and the banking interest, who own the corporations, and bankroll the LIblabCon , and invdiviidual politicians who become very wealthy as a result. The corporations thus conrtol them and therefore all their decisions favour the corporate interest against the people’s interest.. Today’s appalling announcement on the 3rd runway exemplifies this. They simply do not care about the suffering of the people. As with almost everything that comes out of Heathrow on noise, it is simply PR and box ticking – they have no legal requirement to alter their behaviour therefore they have absolutely no intention of doing so; why should they? The fault lies with the regulators, the DfT and the CAA and the virtual absence of functioning noise regulation. If any other industry blighted local communities in the way Heathrow do, they would be served with a legal notice to desist or be shut down.